Even though it may be an exaggeration, when someone suggests McDonald's restaurants have been doing more than the government in helping rough sleepers, the responsible government officials should feel ashamed and embarrassed. And well they should, for it's their responsibility rather than the fast food chain to provide a cure for Hong Kong's housing sickness. The findings of a recent survey by the Junior Chamber International were alarming. Although it's been known for some time McDonald's outlets that open all night are homes to some, it's still distressing to know the number of "McRefugees" - those spending their nights at McDonald's - has soared nearly 600 percent over the past five years. It's a brutal reminder of how pathetic our housing problem has become. The survey was conducted in June, during which 334 "McSleepers," a more refined synonym for "McRefugees," were located at 84 of the restaurant chain's 110 branches that open 24 hours. The last exercise in 2013 found 57 rough sleepers during the polling period. That's most likely only the visible tip of the iceberg. As for McDonald's, that's certainly a situation it'd prefer not to see. I can't help wondering whether the sleepers would have been thrown out onto the streets if they had curled up for a nap in other restaurants, or at air-conditioned government community halls overseen by security guards. Staff at the McDonald's should be complimented for showing compassion to the vulnerable. As for the SAR as a whole, it's an unflattering trend. It may be argued that 334 is miniscule compared to a 7.35-million population, but it's still a harsh reminder of the housing crisis that's affecting most citizens who aren't filthy rich. It's pathetic. 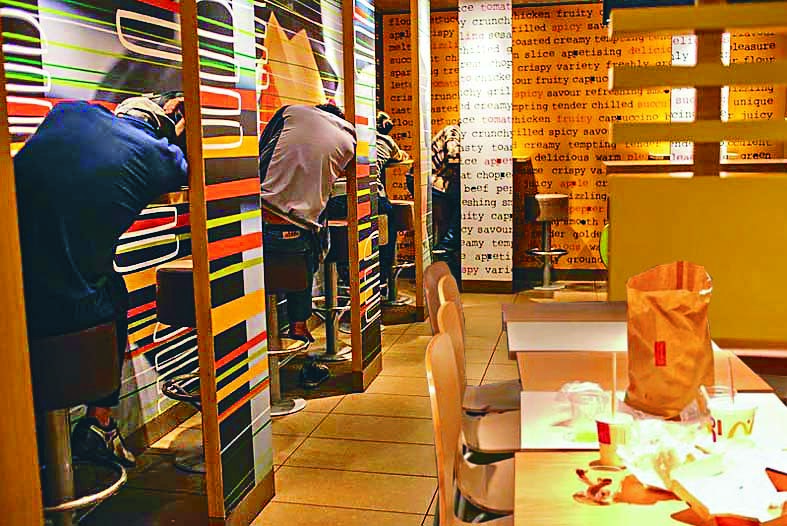 The survey says people have been sleeping at McDonald's for different reasons, such as comfortable air-conditioned environment, security, expensive rents, poor family relationship, etc. Those factors are closely related to one another, often boiling down to the extremely high cost of housing that in turn results in over-crowdedness, as grown-up children can't afford to leave their parents' homes to live independently. Meanwhile, the notorious summer heat is making matters worse. It's a well-known fact that housing costs are murderously expensive, so it requires no further elaboration for policymakers to appreciate. Shame won't solve the problem. However, if one is capable of feeling embarrassed, there may be greater determination to tackle the SAR's urgent housing crisis. Nobody wants to go bonkers, but the lack of decent living space can drive people mad. The government is now in the midst of searching for more land to build new homes, with further details expected in Chief Executive Carrie Lam Cheng Yuet-ngor's policy address due in October. She can no longer afford to pay too much concern to long-standing taboos -- such as public-private cooperation - at the expense of speeding up construction. When the Junior Chamber carries out another survey in five years, will it be able to proudly show a drop in the number of McRefugees? Let's hope so.